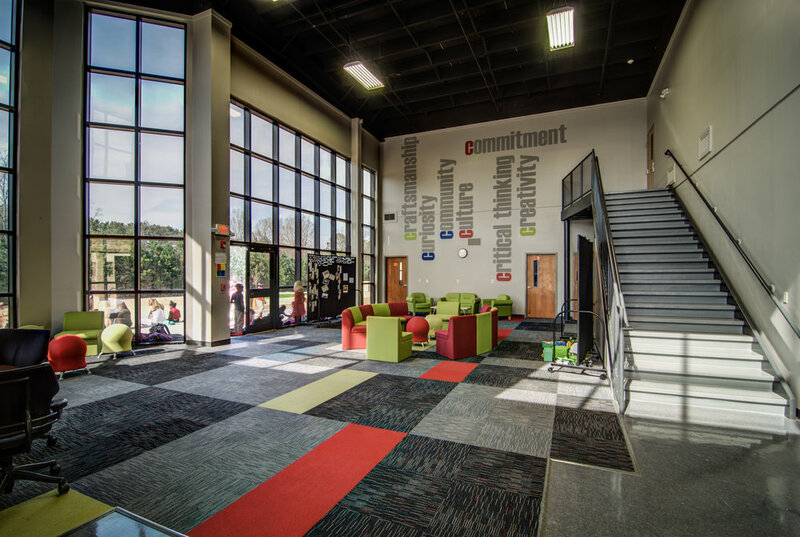 CROFT provided full A/E design services for phases the functional conversion of an existing facility into a 42 instructional classroom Brighten Academy Charter School in Douglasville, GA. The complex interior renovation and expansion project consisted of redeveloping a tightly planned, nine acre site at the intersection of Priestley Mill Road and Timber Ridge Drive to include the partial renovation of an existing two-story facility of approximately 30,000 SF, in addition to construction of a new 45,000 SF, three-story building connected with a breezeway connector. Working under an immovable project budget, CROFT’s design team functionally transformed an antiquated former church into a state-of-the art instructional classroom facility that included classrooms, computer labs, assembly areas, media center, break-out areas, restrooms, ADA upgrades, pre-function spaces, and exterior landscaping.